Through a press release on 1st September 2009, Canon released the EOS 7D Digital SLR Camera, incorporating a new 18MP sensor and an ISO range expandable to an incredible value of 12,800 (usually between 100 and 6,400). This new model was built to create a new photo experience for professional photographers. The camera can take pictures up to a 5184 x 3456 resolution and each pixel is 4.3 microns in size. The top speed of the shutter is 8 frames per second and the DUAL DIGIC 4 are specially integrated to make the process faster than before. Canon EOS 7D Digital includes a RAW button, a new 19-point autofocus system and a multi-function button for accessing different functions, all being new features. The dimensions of the camera are 148 x 111 x 74 mm (5.8 x 4.3 x 2.8 inches), and it weighs 820g (1.8 lb) without the battery. The great 18-megapixel sensor has an impressively low noise and superb detail quality. The quality of the images is quite impressive, both in digital format and printed. Even if the ISOs are set at the highest level possible, Canon EOS 7D offers better pictures than other cameras, such as Nikon D300S, Nikon D700S or Canon 5D II, while also maintaining the noise very low. The almost perfect viewfinder coverage is something that is now available only at few other competitors, such as Pentax K7 or Sony A900. Moreover, 7D's viewfinder delivers a 1.0x magnification. In low light, a red light comes to illuminate LCD's features. The system detects the light level and automatically turns the light on or off. This feature can also be turned off from the options. The leveling feature of the Live View is easy to use. It's comparable to an airplane indicator, with a red horizontal line in the middle of a circle. When you've set the camera in a good angle, the line in the middle of the circle will turn green. The processor is a DUAL DIGIC 4 which makes the 7D very fast for its price level. As said before, it can capture 8 frames per second, with a 94 JPEGs depth. Instead of getting JPEGs, you might want to have RAWs, but the camera can only shoot up to 15. This processor is not just making the work faster, but also gives more quality to the final result. Features of the 7D include Highlight Tone Priority, which can be used to modify the details in the highlighted areas. The shutter is rated at 150,000 cycles and is designed exactly like the one used in Canon EOS 1D Mark II N and Canon EOS Mark III. The sound of the shutter is quicker than in other models, but I still think it's a bit disturbing. One of the new autofocus features is the AF system with 19 autofocus points. The AI Servo AF system got better since Canon 50D, meaning the camera can take better motion pictures than its predecessor. The built-in flash covers wider angles up to 15mm. However, if using the ISO at 100, the range is limited to 12 meters. The maximum for Canon 50D was 13 meters. 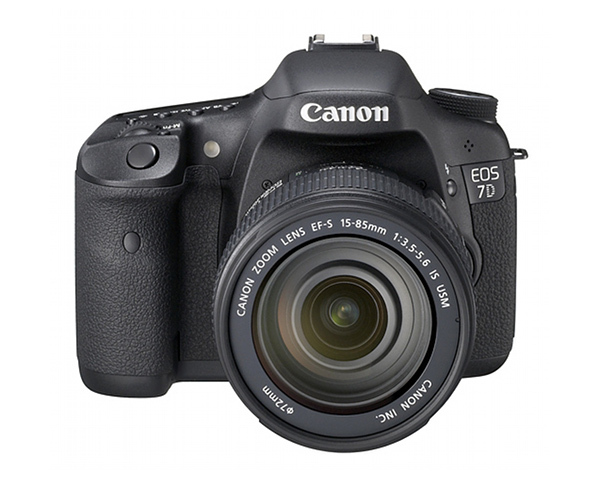 Canon EOS 7D can also video shoot, and the easy accessible mode supports Manual and Auto exposure. The maximum resolution is 1920 x 1090 pixels, with an 16:9 aspect ratio. This is equals to Full HD, so there's a lot of quality in the product. There's also the option to shoot at a lower resolution, such as 640x480 at 30 fps. However, 7D is not made for video shooting, so try avoiding buying it if your only purpose is video. The body is made from Magnesium alloy and also has environmental protections, meaning the camera can be used in poor weather. Furthermore, the camera even has an integrated cleaning system and 150,000 release shutter durability. The Auto ISO is not configurable. AF is not so good in low light as it was in 7D's predecessor, 50D. The same can be said about the in-built flash, which also makes a lot of noise when it pops-out. Increased flash EV compensation results in dimmer images, if value os above 1.0 EV. The large screen and Live View reduces battery capacity and life, and switching to it usually takes more than one second, which can be considered a slow reaction time. Canon EOS 7D Digital includes in the box: a body cap, an EF 28-135mm f/3.5-5.6 IS Lens, lens caps, wide strap ER-EOS7D, battery charger and pack, video cable, USB cable, software CD and instruction manuals. Though, for the lenses and lens caps you have to purchase a separate kit.